Imablog – Page 30 – Perspectives of a Canadian in the Old/Deep/New/Geographic South: This is where I ramble on about nothing in particular and post a few nice pictures. The Space Shuttle Atlantis exhibit at the Kennedy Space Center is my new favourite place to go now. The last time we were at KSC (back in 2012), the exhibit building was still under construction. Didn’t get to make it back for the exhibit opening, so we made sure to include it as part of the itinerary for our cruise last week. The exhibit building is easy to find. 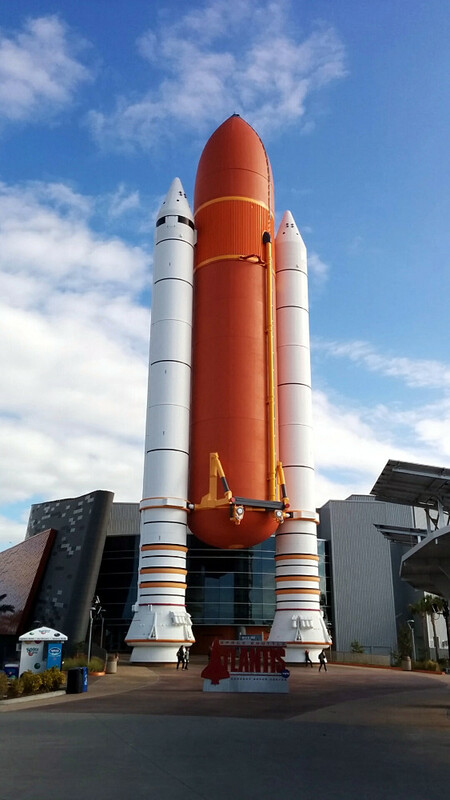 Just look for the great big orange fuel tank of the shuttle booster rocket (it’s a full sized replica). The exhibit starts with a short film about the history of the space shuttle program, after which the big door opens and you see the Shuttle Atlantis in all its glory. The Shuttle exhibit is pretty well done with lots of interactive displays, simulators and a “Meet a specialist” program where you can talk with people who worked on the shuttles. Having grown up during the space shuttle era, I never imagined that I’d actually get to see it up close. There are a few places where you can reach out and almost touch the shuttle. You can even read the numbers on the heat shield tiles and see the texture of the heat shield blankets. So awesome. Also part of the exhibit is a tribute for the crew of the Challenger and Columbia space shuttles. A very moving display with personal items that belonged to each crew member. Also part of the display is a body panel from Challenger and the cockpit windows from Columbia. You can’t help but spend a few quiet moments here. The workbench has a top now! After browsing around Home Depot for a bit, I ended up going with 8 foot long 2×8″ boards for the top. A little rougher than the 1×8″ boards I was initially thinking about, but the 2×8″ boards were significantly less expensive. The end result is essentially the same though. The edges aren’t exactly the most square so there are some tiny gaps between each board, but nothing big enough that stuff will fall through them. Next task will be to take the sander to it and smooth it out some. After that, it will be ready to use (unless I decide to do some coats of polyurethane or something). Finally got around to starting on building a new workbench in the garage last weekend. 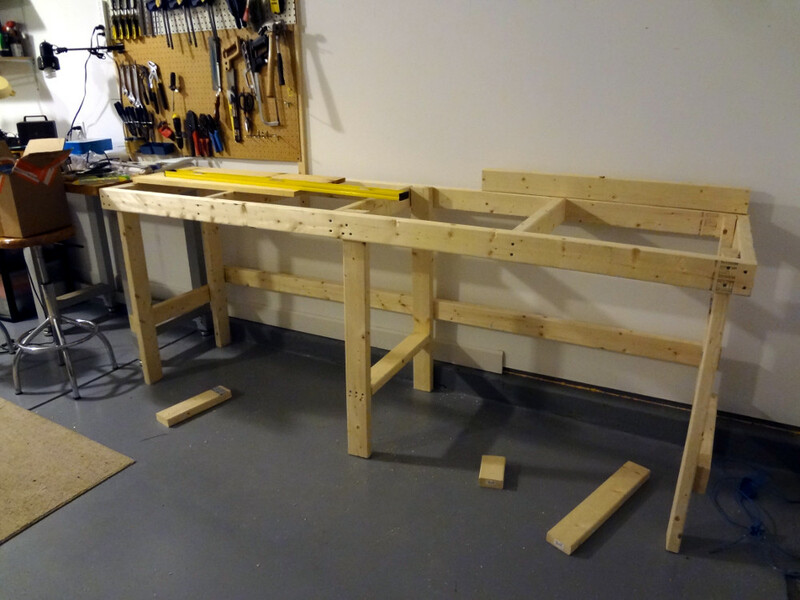 It’s a simple workbench built from 8 foot long 2x4s and 2.5″ deck screws. My original plan was to make the workbench 6 feet long, but it fit into the space pretty nicely at 8 feet long, so I just went with that. Two fewer cuts to make too. Took a few hours to lay things out, cut and screw everything together. Out on the driveway it seemed a bit on the wobbly side, but once I got it into the garage, it was fine. The workbench was mostly level too. Had to adjust a couple of the legs to make them flush with the top but that was an easy task. Pretty happy with the way it turned out so far. For the top of the workbench, I was initially thinking plywood but I think I’m going to go with 8 foot long 1″x12″ boards. 4 of them will go along the top nicely leaving a good sized lip for clamping things to. The boards will be easier to transport in the car too. I got to vote in my very first presidential election after work today. Figured everybody would be trying to get in early to vote, so I planned on heading out from work a bit early to try and beat the after-work rush. My polling place was at the Pimlico Community Center not too far from the house. I hadn’t been there before but it wasn’t too hard to find. Encountered no lines at the polling place. A lot of cars out front, but I think a lot of them must have belonged to poll workers. I walked right in, showed my ID and went to the voting station. In and out in about 5 minutes. Sadly they did not have any “I voted” stickers to give out when I was there.